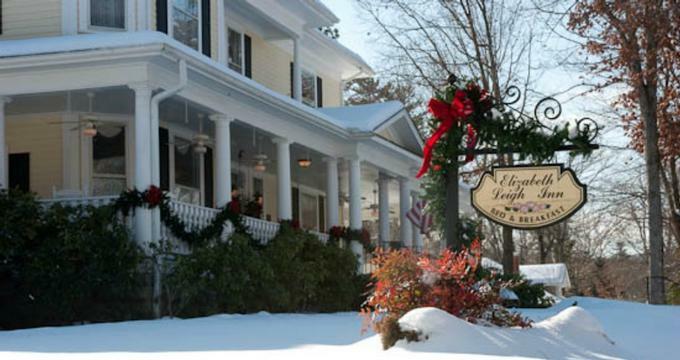 The Elizabeth Leigh Inn is an elegant bed and breakfast Inn in the heart of Hendersonville. Originally built in 1893 as one of the finest homes of old Hendersonville, the building has been lovingly restored to its former glory and now offers luxurious accommodations, upscale amenities and gourmet cuisine in a quiet, refined setting. Listed on the National Register of Historic Places, this stately bed and breakfast hotel is a short walk from downtown Hendersonville and is the perfect base for those wanting a tranquil escape from the stresses of everyday life. The Elizabeth Leigh Inn features four beautifully appointed and warmly decorated guest suites with individual character and charm. Each suite has a sumptuous king-size bed with luxury linens, and down comforters, an en-suite bathroom with walk-in shower, thick towels and bathrobes, and branded toiletries. Cozy sitting areas boast English Cottage-style décor with oversized armchairs and elegant fireplaces. The Rose Room is located on the main floor of the Inn and features a beautifully carved four poster king-size bed with luxury linens, an en-suite bathroom with shower, thick towels and bathrobes, and branded toiletries, and a comfortable sitting area with an armchair and a fireplace. The Blue Room is found on the second floor of the Inn and features gleaming wooden floors and beautiful views from the windows. The room has a white wrought iron king-size bed in deluxe linens, a private bathroom with a shower, thick towels and bathrobes, and branded toiletries, and blue overstuffed armchair and sofa. The Sage Room is located on the second floor of the Inn with wooden flooring and large windows overlooking the garden. The room has a gorgeous king-size sleigh bed with luxury linens and down comforters and two oversized armchairs in front of an elegant fireplace and carved mantle. A private bathroom offers a shower, thick towels and bathrobes, and branded toiletries. The Lavender Room is the largest and most romantic of all the rooms in the Inn with wooden flooring, soft lilac hues and a spacious en-suite bathroom with a shower, single vanity, thick towels and bathrobes, and branded toiletries. A beautifully carved four poster bed has a pillowtop mattress, luxury linens and down comforters and a sitting offer a daybed, plush sofa, and cozy fireplace. A full hot breakfast is served every morning in the formal dining room and includes a variety of egg dishes paired with bacon or sausage, freshly squeezed orange juice, locally brewed artisan coffee and organic teas. Complimentary snacks and beverages are available in the guest pantry throughout the day. Upscale amenities at the Elizabeth Leigh Inn include luxurious accommodations with working fireplaces and complimentary wireless Internet, a delicious gourmet breakfast served every morning, a guest pantry with snacks and beverages, including homemade ice cream, and a full range of concierge services, such as real estate tours, dinner reservations, and massage appointments. The historic town of Hendersonville is listed on the National Register of Historic Places and has an array of attractions and activities to enjoy from art galleries, museums and historic sites to shopping, art shows, parades, and outdoor recreation. The Henderson County Curb Market is a unique farmers market that sells a variety of hand-made items and locally grown produce from baked goodies and fresh fruit to flowers, toys, and clothing. The Western North Carolina Air Museum showcases award-winning restored and replica antique and vintage airplanes, while the Henderson County Heritage Museum tells the story of the history of Henderson County through public display galleries, demonstrations, exhibitions, and performances. The Historic Johnson Farm is an outstanding example of a late 19th-century farm with a smokehouse, blacksmith shop, barn and boarding house, and has become a popular tourist attraction in the area. Other attractions worth visiting include the Hands On! – A Child’s Gallery, the Historic Hendersonville Train Depot, the Mineral & Lapidary, Jump Off Rock, and the Holmes Educational and DuPont State Recreational Forests.